DUSHANBE (Ministry of Culture press service) — For the first time, Tajikistan’s Culture Days will take place in Doha, the capital of Qatar, from November 22 to 28. Performing at the Big Theatre of Moscow, on October 7 2018. The famous Tajik artists Davlatmand Kholov, Khudzhastai Mirzovali, Fotima Mashrabova, Sitora Karomatullo, Amirjon Ruziyev, Damirbek Olimov and Dance Ensemble “Parastu” will perform before the audience in the capital of Qatar. 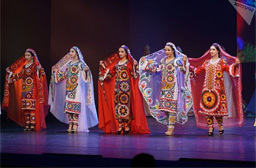 Also in Doha, exhibitions of Tajik artists and photographers and craftsmen will be organized. The Tajik delegation will be headed by the Minister of Culture of the Republic, Shamsiddin Orumbekzoda.